Have you ever jotted down recipes from a book, magazine, internet, etc thinking that you will make it like yesterday and never got down to it? I have and not just a few recipes, but loads of them which tend to disappear among the many pages of my recipe book or are used as book markers. Jotting down the recipes is not a bad thing you might think, but what if you have not noted down the method? While going through the recipe, I had not noted down the method, thinking that oh I know how its done and I am going to make it soon. The method may remain fresh in you head for a few days but not years! One such recipe is the spinach and baby corn soup. The method was missing and some of the ingredients I couldn’t read as the page had become all smudgy. However I had baby corn and I just wanted to make it into a soup. Once an idea comes into my head, I cannot see an alternative as I get fixated to the original idea. This definitely does not make me a versatile candidate for Master Chef! So, getting back to the recipe, with fresh baby corn and spinach in my fresh, set about trying to make a Chinese style soup, you know the famous seed corn type where sometimes the base or liquid part is so thick because of the cornflour. Here I decided to replace the cornflour with rice flour and used other ingredients that I had. Go on try out this simple and absolutely filling soup. Mix rice flour with the measured water or stock. When it is hot add the onion and garlic and stir fry it for a minute or so. Add the sliced baby corn. Stir fry for a minute or so. Cover the pan with a lid, lower the heat and let the baby corn cook for 1-2 minutes. Add the water or stock. Add salt. Stir the soup till it becomes hot. Let the soup come to a gentle simmer. Let it simmer over low heat till the corn is just cooked but not overcooked. Add the chopped spinach and let it cook for 2 minutes or so and serve. Serve the soup with some soy sauce and chilli sauce. You can add other spices of your choice. If you using ready made stock, add salt accordingly. Don’t over cook the spinach and baby corn. Lol we are birds of the same feather. I had taken recipe from my mother n now I have just the ingredients don’t know what to make of them. Too sentimental to throw them out. Anyway I love your soup recipe. I am grateful to internet now I can bookmark n come back. This soup is a definitely rainy season special for us. The soup looks so yummy.. I like the colour contrast .. greens floating in the soup.. Lovely ! This looks like the type of soup I could eat everyday. Simply delicious. The soup looks vibrant mayuri ji! Love the simplicity and yet the flavors are amazing!! Would love to try this as both my kids enjoy a good soup! Thanks Priya, please do try it. This is one of my favorite soup.. light and healthy.. I love the crunch of babycorns in it.. Beautiful pics loved the colors of the soup!! Very delicious and healthy share. Thanks Swati, I too love baby corn. I love this lovely and healthy soup with my favourite baby corn. Like you I keep cutting out recipes from magazines etc and not getting round to doing anything with them!! Thanks Mina, I’m sure so many bloggers have so many recipes that they want to try out. I can so related to what you said. I have jotted down just the ingredients many times, and later just wish to remember the procedure. 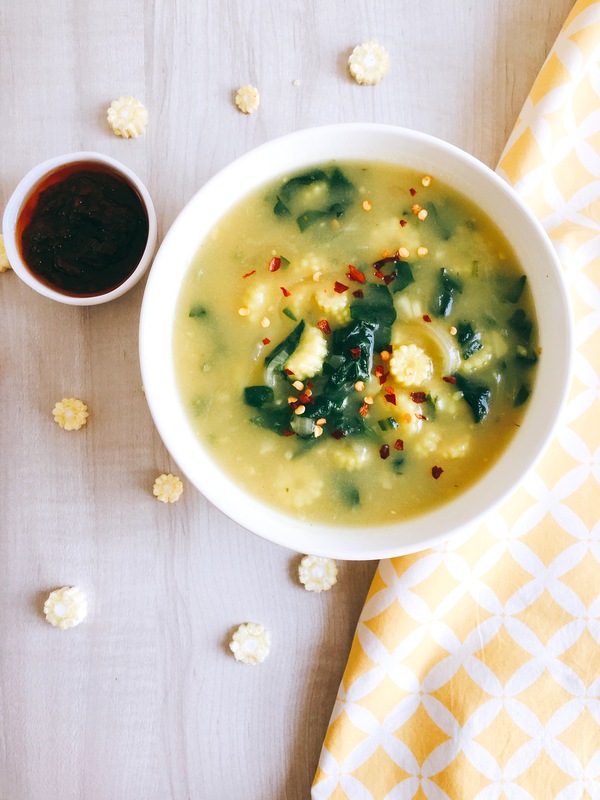 The spinach and baby corn soup looks so comforting and with winters does not seem to end here, I can make this right away. Beautiful clicks. Thank you so much Renu, do give this soup a try.